It's my pleasure to have master engineer Pete Lyman of Infrasonic Sound on the latest Inner Circle podcast. Infrasonic is one of the few mastering houses still doing vinyl, with not only one, but two lathes going almost around the clock. 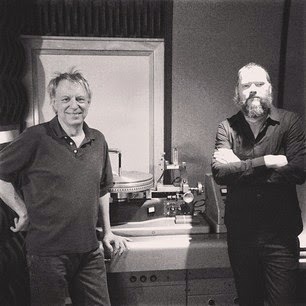 Pete and I will talk a lot about vinyl, as well as mastering in general. In the intro, I'll discuss the going price to hire your favorite artists as well as mixing with mastering in mind. I know you're really going to enjoy this one. Here's the isolated vocals from one of the major hits of the last few years. It's Adele's "Rolling In The Deep," and it gives you an idea of how vocal mixing has changed over the last few years. Here's what to listen for. 1. The vocal is drenched in a very dark reverb that's very apparent here, but not necessarily in the mix. This is different from about 5 years ago when most vocals were fairly dry or had very short reverbs, and it's a current trend in mixing. 2. The vocal changes at the pre-chorus at :36 as another vocal effect enters (sounds like a very short stereo verb) that makes the vocal larger. It stays like this for the rest of the song. 3. Like many other current pop songs, the background vocals play a large part in the production, even though they may not seem that prominent in the final mix. You can hear as they go from very narrow stereo, to mono, to dropping out completely at 2:08 (which is technically the bridge), to getting more complex towards the end as a low descending part is added. 4. The vocal also has a very dark timed delay on it that's barely perceptible until the very end. Listen to the repeats at 3:39. A number of my friends recently began using a Native Instruments Maschine for programming beats when they're in the EDM world or need something that's EDM oriented. It's a very cool instrument and what can be considered the latest iteration of the venerable drum machine that many of us grew up with, but with the ability to add chords and melody too. Here's a cool playlist of 6 videos that provides a quick overview of everything that Maschine can do. For those of you who have an aversion to such things, keep an open mind as you'll see how easy programming the instrument can be. You can find out more about Maschine via the Native Instruments website. I've posted this excerpt from my Studio Builder's Handbook (written with Dennis Moody) before, but it seems appropriate to post it again. 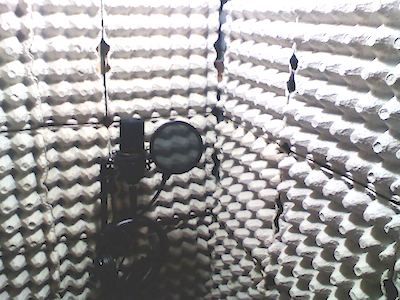 I'll cover just what to do to improve your studio's isolation in another post, but first, here's what NOT to use. Mattresses - There are so many things wrong with this that it’s hard to know where to start. Sure mattresses are made up of a lot of soft material, but it’s not the right kind for sound absorption, won’t affect the low frequencies at all (which are what causes most of the the isolation problems), accumulates mold and moisture, and makes nice homes for rodents and other unwanted critters. Plus, it’s pretty difficult to get enough of them to cover a room, and they take up so much space for so little benefit in return. Egg Crates - Egg crates are light porous cardboard and do absolutely nothing for soundproofing. They can act as a sound diffusor at higher frequencies, but the bandwidth is so limited that they’re virtually useless there as well. Plus, they're highly flammable! It’s difficult to find enough of them to cover a room, but frankly, even using one is too many. Carpet - Carpet attached to the wall is another product that will affect the sound of the room yet do nothing in the way of soundproofing since it doesn’t affect the low frequencies, which are the ones that you’ve got to control for good isolation. Carpet has exactly the same problem as mattresses in that it will begin to smell over time. Old or new carpet makes no difference, except that older carpet will smell more. Foam Rubber - Foam rubber does have some acoustical absorption properties, but once again will do very little for the low frequencies that will cause all of your problems with the neighbors. It’s can be as expensive as materials with real acoustic control properties, degrades over time, and will burn like crazy if given the chance. Rubber - Floor matts, mouse pads, neoprene, or any other variation of rubber will do very little to stop sound coming or going from your room. Once again, it’s much cheaper to buy proper acoustic materials that are easier to work with, but they won’t help your isolation problem either. Wall Cellulose - Pumping cellulose insulation into walls can make a slight difference, but it’s marginal since there are much more effective ways to improve the isolation that are much cheaper. It can be helpful if used along with some other techniques that we’ll soon go over, but isn’t particularly effective by itself. Fiberglass Insulation - Common fiberglass insulation once again has little ability to stop enough of the low frequencies that bug your neighbors, although, like with blown cellulose, it can be useful in conjunction with other techniques. Just pinning it to the wall won’t help though, but it will affect the acoustics of the room. It’s also a skin and eye irritant, takes up a lot of space, and the dust can be hazardous to your lungs when left exposed. As you’ll soon see, there’s a much better way to use fiberglass for acoustic control (although it still won’t help with isolation much). Plywood Panels - It’s true that plywood panels provide mass and mass is what’s needed to stop sound transmission (especially the low frequencies), but the problem is that wood transfers sound too well so the construction technique used is crucial. Not only that, if the panels are too thin they’ll resonate and vibrate, causing an even bigger problem. Particle Board - See plywood panels. Bales Of Hay - Unless you live out in the country, it’s unlikely that hay bales are much of an option, but they actually do work. The problem is that they take up a lot of usable space, make a nice home for critters, and are a major fire hazard. Not recommended! Acoustic Foam - Acoustic foam is helpful in controlling the acoustics within a room, but it does nothing to stop sound transmission and is expensive to boot. Acoustic foam doesn’t even begin to affect the offending low frequencies, and using too much just makes the room seem dead and uncomfortable. There are much cheaper ways to achieve a better result. Understand that all of these materials will have at least some affect on the sound of the room (which we’ll cover later in the chapter), but will do almost nothing by themselves to help improve your isolation. To read additional excerpts from The Studio Builder's Handbook and my other books, go to the excerpts section of bobbyowsinski.com. Recently I wrote about what looked like the last days of the famous RCA Studio A in Nashville. The studio had been ground zero for hits from everyone from Willie Nelson to Keith Urban, but developers had purchased the property and had planned to convert it into luxury condominiums. Ben Folds, the current tenant of the studio, couldn't afford to purchase the studio himself, but managed to organize a groundswell of people who wanted to preserve the site in the interest of history. After lots of press, a new buyer emerged with the intent of keeping the studio as a studio, a most wonderful turn of events. On Friday, Bravo Development announced that it had entered into a contract for the sale of RCA Studio A to AMT Trust for $5.6 million, a tidy profit over the $4.1 million the company had originally paid for it. 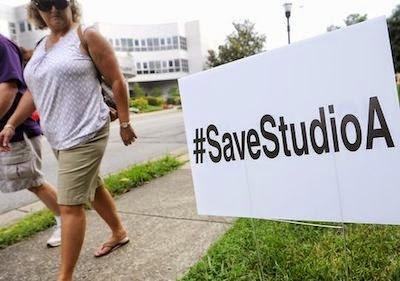 AMT Trust is a non-profit organization led by Leiper's Fork philanthropist Aubrey Preston, with the specific intention of saving Studio A from the wrecking ball. The deal finalizes today at 5PM, but other potential buyers still can submit a bid until that time, so it's not a done deal yet. That said, this looks like a great victory for keeping the venerable old studio alive. So many of the great recording facilities of yesterday have died, mostly because of soaring real estate costs. The expense of owning a major commercial studio is more than ever, but the prices that you can charge a client have actually gone down over the last 15 years. Just about the only way to save a studio like this anymore is to have it declared an historical site. Thankfully, it looks that the piece of history that is RCA Studio A will live to see many more productive days. We've seen a number of evolutionary steps through the years when it comes to mixing consoles in both live sound and the studio. If we just look at the broad picture, the first evolution came when analog mixers started to pack a large number of channels and 24 inputs was considered small. The next came when gates and compressors became standard on every channel. A big one came with digital consoles, and an even bigger one with consoles that were basically just computer controllers. But another evolution is afoot with the new series of remotely controlled consoles via a phone or tablet like the new Behringer X32-Core and Presonus RM series mixers. Today we'll look just at the X32-Core, the guts of the company's very popular X32 mixer, which takes up a single rack space and supplies 40 inputs and 25 busses. The inputs are line in only, which isn't much of a problem in a studio using outboard mic preamps. For live, the X32-Core is set up to accept the S16 digital snake that has 16 remote controllable Midas preamps and 8 outputs. Additional S16s can be cascaded as needed. The system also comes with a Virtual Rack of 8 stereo effects that emulate some great processors like the Lexicon 480, EMT 250 and PCM70, Quantec QRS and more. The whole thing can then be controlled via a free iPhone and iPad app. All this is made possible thanks to the new era of networked digital audio that we now live in, where AES50 network protocol over CAT5e cable is the new norm. It also provides the ability to easily connect with other digital gear for either a standard mixer or monitor hardware interface, or personal monitor systems. The best part is that the X32-Core has a street price of $799 and the S16 is $899. That's a lot of power for not much money. Check out the websites for the X32-Core and the S16.